The job of the S-IC and its five F-1 engines was to lift the stack to an altitude of 70 kilometres and accelerate it to a speed of about 8,500 kilometres per hour. As it did so, the acceleration felt by the crew gradually increased. In common parlance, acceleration is stated in terms of g-forces, because the force we feel on Earth due to gravity is directly comparable to the force imparted by an accelerating vehicle. 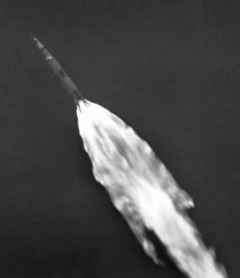 Apollo 15's S-IC exhaust plume expands in the thinner air. Therefore, it is useful to relate acceleration forces to something of which everyone has a lifetime's experience, so when the Saturn was sitting on the pad, the crew felt an acceleration of 1 g, due entirely to Earth's gravity. Because the Saturn V weighed down on the launch pad with almost as much force as the engines were pushing up, the stack initially rose quite gently with g-forces barely above 1 g. However, the consumption of 15 tonnes of propellants every second lightened the vehicle considerably as it flew, decreasing the mass the engines had to push against, so increasing the acceleration forces imposed upon the crew. A small additional source of rising acceleration was the improving efficiency of the F-1 engines. 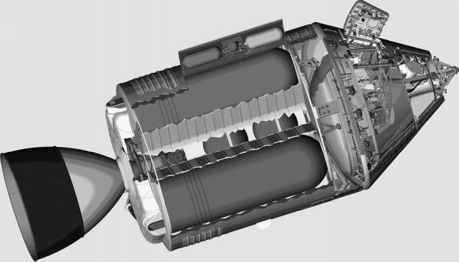 A rocket engine works by burning propellants in a combustion chamber. The heat of combustion causes the gases to expand very rapidly, exerting massive pressure on the walls of the chamber. If one of those walls is missing (because someone has placed a nozzle there), the pressure within the chamber becomes unbalanced, resulting in a force. However, at sea-level, the pressure of Earth's atmosphere has the effect of slightly capping the open end of the nozzle, somewhat inhibiting the high-speed flow of exhaust gases and reducing the thrust that the engine can generate. By the time the virtually empty S-IC gave its final push, the atmosphere had become essentially a vacuum, reducing the back-pressure against which the exhaust gases had to contend as they left the nozzle and improving the thrust by nearly 20 per cent. Each engine, which had started out with a thrust equivalent to 680 tonnes, was pushing with 815 tonnes force just prior to the exhaustion of the first stage. 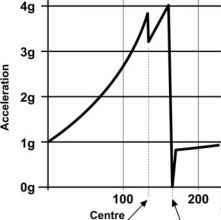 In response to these two effects - an increasingly light S-IC and five increasingly efficient engines - the acceleration continued ramping up ever faster until about 2% minutes into the flight when, having reached nearly 4 g, the centre engine of the S-IC was commanded to shut down to keep their subsequent acceleration within limits. Graph of g-forces during first-stage flight. Under the power of the remaining engines, the g-forces continued to rise as the vehicle lightened. Cutting off one engine early not only curtailed the rising acceleration, it also lessened the jolt felt by the stack and the crew when the remaining engines cut out. Additionally, it flagged the Saturn's computer to think about starting Timebase 2, which did begin once the computer had sensed that adequate speed had been gained. The computer then sensed propellant levels in the nearly empty tanks and prepared to shut down the remaining four engines. The acceleration again rose to 4 g about 25 seconds after the centre engine cut-off, by which time the outer four engines were expected to have shut down.